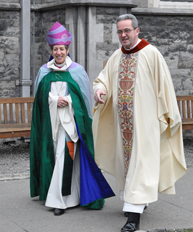 Episcopal News Service report on the Presiding Bishop's visit to the Primates' meeting in Dublin, Ireland. "We're challenged in this very body to 'show up,' to present ourselves ready, willing, and able to help heal this broken world," Presiding Bishop Katharine Jefferts Schori said on Jan. 30 during her sermon at the 9 a.m. Sung Eucharist service at Christ Church Cathedral in Dublin, Ireland. Highlighting sobering statistics of child mortality rates in some parts of the world – like Angola, where nearly 20 percent of children die before their first birthday – Jefferts Schori said the healing of the world "needs the participation and leadership of all parts of the body of Christ. It starts with urgent voices, and changed hearts, our own conversion, and our challenge to systems that perpetuate all kinds of sickness and death around the world." Kato "has been a strong voice for the basic human rights of gay and lesbian people," Jefferts Schori said. "His voice has been silenced. We can pray that others will continue that work, or be challenged by the brutality of his death into some conversion of heart. Will we challenge the world to respect the dignity of every single human being?" Jefferts Schori is attending the Jan. 25-30 meeting of Anglican primates at the Emmaus Retreat Centre near Dublin. Seven primates have chosen to stay away from the meeting because of Jefferts Schori's presence and recent developments supporting the full inclusion of gay and lesbian people in the Episcopal Church. She IS awesome. I love what you quoted at the beginning: if we would all just remember this and live this way!